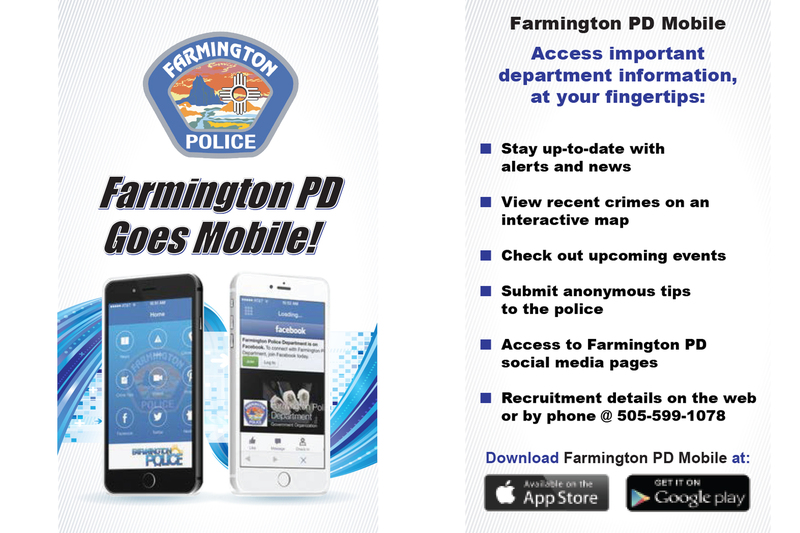 Farmington, NM – The Farmington Police Department just launched their new mobile application which will make information exchange easier. The app is available for iOS and Android users and houses all the department’s online platforms in addition to a crime tip submission link and virtual crime map. The department will use the application to disseminate information to the community more efficiently. “There is an alert feature within the application that will enable us to send out emergency information, such as weather related incidents or endangered missing persons. This is just one more tool to help ensure critical information is reaching the community,” Georgette Allen, public information officer. What does the mobile app mean for the public? Community members can easily and anonymously submit crime tips through the app, receive alerts and updates, and participate in virtual neighborhood watch programs. Included in the app is a link to Nextdoor.com, which allows community members to set up virtual neighborhood watch programs within designated areas. “There’s no need to attend weekly or monthly neighborhood watch meetings when it’s virtual. This is very appealing in today’s society where everyone has limited free time. Neighbors can still exchange information regarding neighborhood activity and support one another as neighbors within this virtual platform. The mobile app will also help increase transparency between our department and the public we serve,” Allen. “We want to emphasize that the app is not to be used to request emergency services. Individuals requiring immediate police assistance need to call 911 for emergencies and non-emergency dispatch for situations requiring immediate assistance but aren’t necessarily an emergency. For example, when you need to report a noise disturbance, this is time sensitive but not an emergency. Calling non-emergency dispatch (334-6622) would be appropriate,” Sergeant Baric Crum. Farmington Police Department will be at the Animas Valley Mall this Saturday to promote their new app. Chief Steve Hebbe will also be there to meet and greet community members and answer questions about the department. For more information about FPD’s new mobile app, stop by their booth located near the food court this Saturday, December 20 from 10:00 a.m. to 2:00 p.m. iOS users may download the app from the Apple App Store. Android users may download it from Google play. Search Farmington Police Department Mobile. Media is welcome to attend this event.